The second phase of my power system was completed this past weekend. 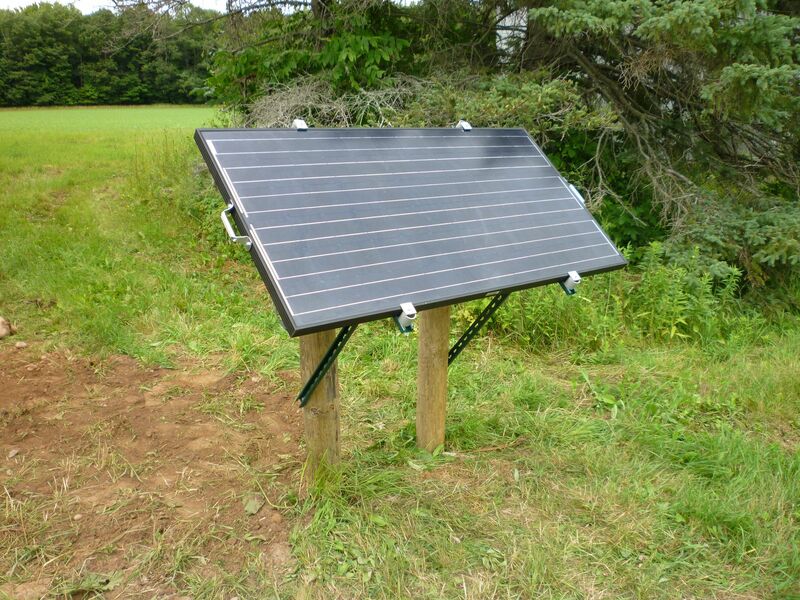 It’s a 190 watt ET Solar panel on a DIY adjustable ground mount feeding into a Morningstar SunSaver MPPT charge controller. This new panel increases my total solar capacity to 318 watts. While it might not seem like much, I’m actually wondering how I’m going to use all that power. I had purchased this panel and the MPPT controller before I had a chance to live with the 128 watt roof mounted array I installed last October. I found that I only consume a small fraction of what the panels produce during the day, then barely put a dent in the stored battery power during the night. With all of my lights being LED and my latest luxury item, a small LCD TV, consuming only 25 watts, I rarely consume more than 40 watts at a time. Even if I need to use my Coleman Stirling cooler, it only adds the equivalent of maybe 15-20 watts. What this new panel will give me is flexibility in the winter and the ability to add a real/larger refrigerator some time in the future. As I mentioned in my previous post, my roof mounted array is not ideal for the winter months. The angle is not steep enough for the low winter sun and I also don’t have an easy way to clear any snow that could accumulate on it. The new mount will allow me to adjust the panel for different seasons and to have easier access for any snow removal. The mount itself is built on two 6″ x 10′ treated posts driven 5 1/2 feet into the ground. 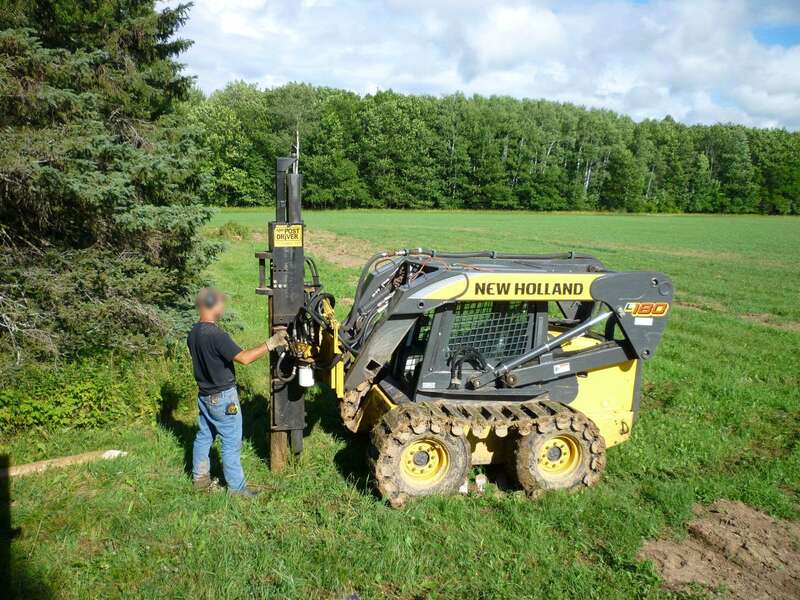 The cost for the two posts and the driving was about $65 – way cheaper and easier than drilling holes and pouring concrete. 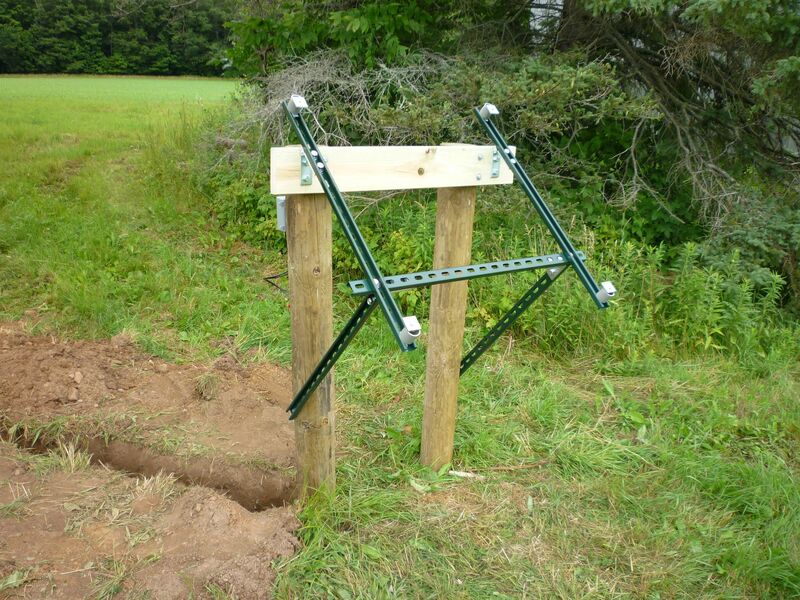 Driven posts should also be less likely to heave from frost than posts in drilled and backfilled holes. While I wouldn’t necessarily trust these for a cabin foundation, I don’t have much to lose in using them on a solar mount. The mount frame is essentially bolted together Unistrut segments. The vertical rails of the frame are attached to a 2″x6″ treated board with a couple of Unistrut hinges which will allow the panel to adjust from 0-90 degrees. The solar panel itself is designed to be easily removed and safely stored in the cabin when I’m away. I modified the panel by adding handles at both ends to allow for easy carrying by two people. The electrical connections are MC4 cables that connect/disconnect in seconds. The current method for securing the solar panel to the Unistrut is only temporary though, until I find a better/quicker way to do it. The hardest part of this project was digging the 16′ trench for the electrical conduit. As with my drywell project last year, I used the cheapest form of labor I could find – one of my sons. With the naturally rocky soil and even rockier backfill next to the cabin, it took him about two hours to dig it by hand. What an inspiration. Tx for sharing your lovely cabin. Is there anything technical that prevents on from going 4 or 5 containers wide? I am with you on the easy electricity usage. Most months the fixed fees are as much as the electricity charges. Hopefully someday when I am owning instead of renting I will be able to get some panels. Keep the posts coming! Steve, if you don’t mind my asking, how much did your solar system total up to in costs? Where did you get your solar panels? I own a tiny cabin on wheels and am wanting to go off the grid myself with solar power. Thanks for your reply! Great job on your shipping container cabin! My solar system cost about $2,500 or so, but it wouldn’t cost anywhere near that now. For example, I had purchased one of my Uni-solar panels back when they were running $7 per watt. Now they can be had for close to $1 per watt. Knowing what I know now, and with panel prices being much cheaper, I could put together an equivalent system for about $1,700. My favorite place to buy solar power equipment is Northern Arizona Wind & Sun. They have everything you need for a small solar system, and they have great technical support also. You have in all likelihood worked out what power drain % you want to allow a battery technology to drain to in terms of cable run, estimated use, watt hours , losses etc. However rule of thumb is that you want 3x the POTENTIAL production power within your system than you use to ensure minimal disruption to what you wish to attain / use, & therein lies the math. But for every 10 watts I use I want to have 30 watts of power producing capability on my roof to take into consideration the seasons (angle) production, defecit, additional bodies at my snug home from home etc. I’d actually condsider a “moveable mount” of twin walled solar thermal so it can be deployed & stored rather than risk of vandalism, theft or stratification, it would likely knock-back your overall electrical consumption ot at least offer some routine balance to lifestyle within the cabin. So really If it were me (if wishes were horses right) !? I’d be looking at a locked of box mount & a ladder to access the roof open up a box from which pivots & locks some solar thermal water tubs to feed & mix a small water tank for domestic use. Another option, is to find a site which sells 2nd hand / new end of line solar panels & simply utilise that, gradually build up a more capable battery bank in the long term. Again with those horses, a chap in Norway (with appropriate savvy) purchased a crashed tesla battery pack & operating system, which he put into server racks & fitted out to supply his house in Oslo (which also has solar) ..cost was not prohibitive compared to the same tech as is being punted around for home use, ..check out how many kilowatt hours a tesla has of electrical delivery. Worth looking at, so much love has gone into the cabin I doubt you’ll rest too long! I will happily point you to the thread (with pictures) & contact of the guy who has had his system running for what I estimate to be 2 years at time of writing. I have yet to read up on the whole blog so look forward to seeing how you deal with storage of supplies such as natural water run off. ..ha ha, the more we build the more complicated we make it! More pictures of the nooks & crannies please. Ah, forgot to say, 3x the potential power AND suitable battery that takes 10-15% of battery capacity of max imum at a push to ensure longevity of cycles rather than premature battery death, obviously winter months can churn out so little compared to peak summer (& presumably optimum directional placement of panels) so use in the low supply months don’t hit you hard & shut down your system when it is ultimately needed.